How I love summer. The sun is out, the days are longer, we can spend more time outside, and most of us feel generally happier and healthier. In Ayurveda we see it as a time when the fire element is increased, there is more warmth, lightness and dryness. These are qualities that increase Pitta and can also increase Vata. If we are of dominant Pitta constitution it is even more important to adjust your routine to cater for the change in weather. Pitta can build up in the digestive system, liver, eyes, skin, and heart at this time of year. This can result in conditions such as diarrhea, inflamed and red skin, sensitive eyes, hypertension, anger and frustration. A light massage with room temperature coconut oil* (or Pitta reducing oil) nourish the skin and clear any heat. Wash this off with cool water. Your diet in the summer should consist of sweet, bitter, astringent flavors and be light and easy to digest. In the summer it is best to avoid all dark meats such as beef, lamb and pork as well as citrus fruits, tomato, garlic, onion, salt and sour dairy products as these all increase pitta. When you are thirsty try drinking cool herbal teas of peppermint, licorice, fennel and rose. Limes are also very cooling. Start your yoga practice with some cooling and calming Sheetali pranayama- this is an especially calming and soothing practice where you roll your tongue into a tube and then draw the air in through this tube and out through your nostrils. You can just feel the cool air chilling you out! Pitta can accumulate in the digestive system, especially the liver and small intestine. Do some abdominal stretches and abdominal twists for helping to clear pitta from your belly. Try Trikonasna (triangle series), Bhujangasana (cobra), Matsyendrasana (twist), Ushtrasana (camel). It is important to not do too many inverted poses (esp headstand) as these bring heat up to your head if you are already a bit of a pitta prone person or are suffering from hypertension. After yoga anoint yourself with some sandalwood or rose oil. Place a drop on your third eye, throat and navel to keep these centers cool and calm. I love Asparagus and have been munching my way through, many stalks, as the season is short lived in NZ Asparagus, in Ayurveda is one of the few vegetables that can be eaten by all doshas with no aggravation. Sweet, astringent and bitter, cool light and moist, it is ideal for Pitta. It stabilises Vata, being easy to digest, and lightens Kapha. Medically it can be used as a slight laxative, nerve sedative, general tonic and demulcent. That aside it tastes delicious just steamed with a dash of ghee, some grated fresh ginger, black pepper and Himalayan salt to taste. 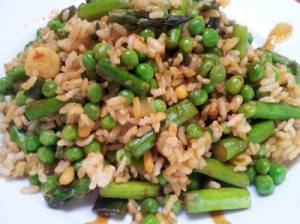 In writing this newsletter I came across this recipe – It is a take on the kitchari recipe given last month utilizing Asparagus as the main vegetable. Have a look – it’s healing and delicious. I have made two huge batches of this stew in the past 3 months and am not tired of it at all. Enjoy something new! Roses are coming into full bloom…here are a couple of recipes that you can utilize to make the most of the petals… It would be appropriate to mention that 1,400,000 hand picked petals are required to produce 1 liter of rose oil (that equates to 67 blossoms to give one drop). We need to remember these statistics and savor and appreciate each drop of oil as a gift of healing. Place the rose petals in a pot or metal bowl. Cover the petals with boiling water and soak for around 1 hour. Strain and pour the rose water into a spray bottle. Store in the fridge. Rose water is slightly astringent, cooling and great for sensitive skin. Ayurveda does not separate Mind and body. We see good health as not just a absence of disease but the ability to be the best that we can possibly be. Emotions have an effect on our health and you will see in the following graphic, emotions traditionally associated with particular organs. Sometimes eating right and exercising is not enough we have to look at our ability to feel and greet our emotions – both good and bad. Carl Jung said “One does not become enlightened by imagining figures of light but by making the dark more conscious. “By facing our emotions we can explore them and develop more resilience This is where mindfulness and meditation have a role – reflection and self-study all play their part in healing.